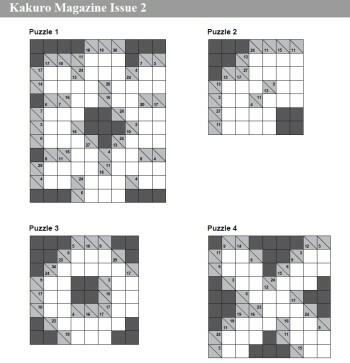 Kakuro is an enjoyable puzzle that originates from Japan, and is sometimes called cross sum and can be thought of almost like a number crossword. There are two issues of kakuro magazine available for purchase. Instead of clues, as one sees in a crossword, there are numbers at the start of each set of cells, called runs. These numbers indicate the sum total of that run. For instance, a '3' at the start of a run of two cells means that the numbers in those cells sum to 3. Allowed numbers are 1 - 9 but no number can repeat within a run. So, if there is a total of '4' off 2 cells then it can only be either 3 followed by 1 or 1 followed by a 3, and '2,2' involves repetition and therefore is not allowed. 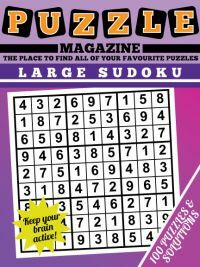 You can solve kakuro using logic and addition skills alone, guessing is never required. 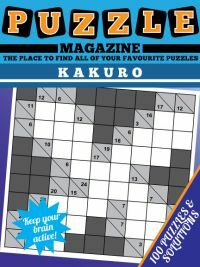 If you've not doing kakuro before, then this collection contains a range of difficulty puzzles and also grid sizes, from small to large, so there is something for everyone in the kakuro puzzle magazine. The key to solving kakuro successfully is to gain familiarity with the various combinations of to understand which sum totals at a given length have only one or two possible answers - this will help you to start solving quickly. As an example if there is a sum of 16 from 2 numbers, then it must be 7 and 9 in some order. 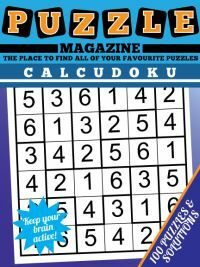 Looking for very high sums or very low sums is often a good tactic for getting started with kakuro puzzles. 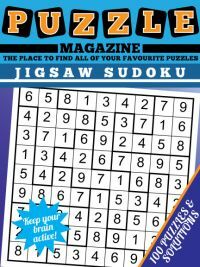 The magazine contains 2 puzzles per page in issue 1, and four puzzles per page in issue 2. 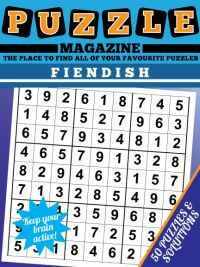 After the puzzle pages are the solution pages that clearly display the solution to each and every puzzle, so if you get stuck or just want to check your answer is correct, you can easily do so here. 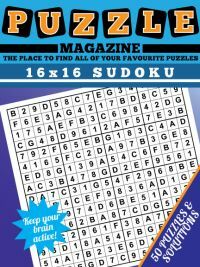 We recommend printing off the puzzle page(s) at your leisure then checking against the solutions on the electronic version. You can view a sample page from the Kakuro Magazine.